The Intercept‘s Sam Biddle (12/14/16) has a breakdown of what public evidence there is that Russia was behind hacks of DNC email accounts. He concludes that while it’s plausible that the Russians or even Russia was involved, it’s a very long way from proven, different agencies dispute it, all the sources we’re reading are anonymous and the assessments themselves are secret. What we’re looking at now is the distinct possibility that the United States will consider military retaliation (digital or otherwise) against Russia, based on nothing but private sector consultants and secret intelligence agency notes. If you care about the country enough to be angry at the prospect of election-meddling, you should be terrified of the prospect of military tensions with Russia based on hidden evidence. Apart from the slipperiness between the possible and the proven, the gap between the confidence of the headlines and the caution buried deep inside, it’s weird to see media skip over the story’s center: that the alleged meddling consisted of revealing true information about the Democratic Party and Clinton campaign. As journalist Bob Parry (Consortium News, 11/18/16) notes, a sort of hysteria in official Washington is now clumsily conflating such real—if embarrassing—news with the phenomenon of “fake news,” though reporting has tracked that phenomenon not to the Kremlin but to Millennials in Macedonia, for example, who figured out how to make money with crazy click-bait stories. But in back of it all, what makes the umbrage of elite media so hard to stomach is the hypocrisy. This is, after all, the same elite media that supports outsider-induced “regime change” anywhere and everywhere they see an official enemy, from Iraq to Honduras to Libya to Syria—and wait, what’s this? 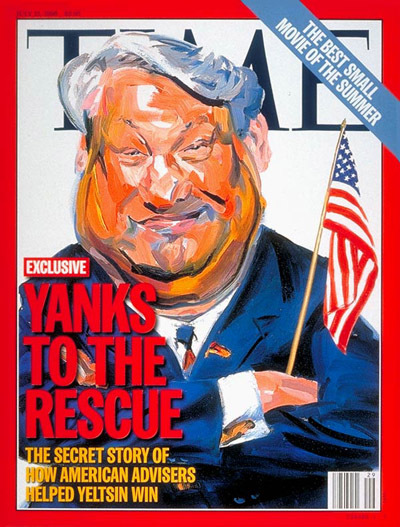 A cover from Time magazine (7/15/96): a chipper Boris Yeltsin holding an American flag, and the line “Yanks to the Rescue! The Secret Story of How American Advisers Helped Yeltsin Win.” You can make “one law for me, another for thee” your credo, but you can’t be too surprised when others are unimpressed. Whatever story there is to be told about Russia and the 2016 election, corporate media have squandered the credibility it would take to tell it.